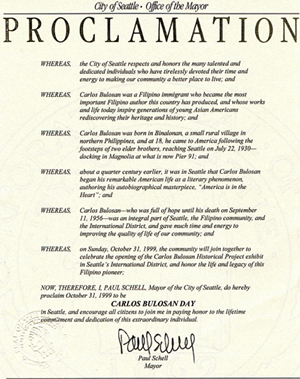 Celebrate Carlos Bulosan Day October 31st! America is also the nameless foreigner, the homeless refugee, the hungry boy begging for a job and the black body dangling from a tree. America is the illiterate immigrant who is ashamed that the world of books and intellectual opportunities is closed to him. We are that nameless foreigner, that homeless refugee, that hungry boy, that illiterate immigrant and that lynched black body. All of us, from the first Adams to the last Filipino, native born or alien, educated or illiterate — We are America!